New Life! is the 9th Christmas Tree Festival at St Andrew’s and St George’s West in the heart of Edinburgh. 40 sparkling Christmas trees light up St Andrew’s and St George’s West Georgian sanctuary, each decorated by a local charity, business or voluntary group. All of our trees come from social enterprise Caring Christmas Trees, supporting homeless people in Edinburgh throughout the winter. Donations this year are shared between three charities Birthlink, Blood Bikes and The Welcoming. 8 – 24 December at St Andrew’s and St George’s West in George Street. Monday-Saturday 10-6pm, Thursdays late until 9pm. Here are some special moments from the 2015 Festival – thanks to all who contributed. The Edinburgh Christmas Tree Festival is an annual event at St Andrew’s and St George’s West in Edinburgh city centre. 40 Christmas trees light up St Andrew’s and St George’s West sanctuary, each telling a different story. The Festival runs throughout Advent and brings together businesses, charities, church and city, offering space for everyone to reflect, celebrate and wonder. Children and nursery schools love to add to a children’s tree and to hear the Christmas Story told with music and puppets and Festival volunteers welcome residents from Edinburgh care homes to enjoy the trees and sing Christmas carols. Local musicians and primary school choirs provide a free programme of live music which is open to everyone. Shoppers and visitors to the city centre are welcome to step inside and find a moment of peace. The trees are a fantastic backdrop for our annual Carols at Six event and for carol services and concerts during Advent. 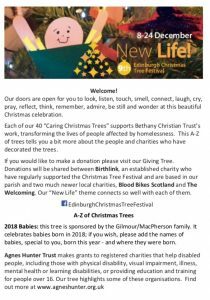 The Edinburgh Christmas Tree Festival supports and raises funds for local charities. Trees are provided by Caring Christmas Trees, a social enterprise which helps homeless people and each year visitors are invited to make a donation which is shared between local charities. Joy to the World in 2017 supported Medecins sans Frontieres, PASDA and VOCAL . At Follow the Star in 2016 donations supported the work of local charities Edinburgh Direct Aid, Richmond’s Hope and Health in Mind. In 2015, SHINE raised over £3,000 and we were able to hand over cheques to Amnesty International UK, Circle and Firsthand Lothian to support their work. In 2014 our nominated charities were Edinburgh Women’s Aid, Hadeel/Palcrafts and Waverley Care. In 2013 over 3,000 people visited, raising over £4,000 for local charities Edinburgh Clothing Store, Cash for Kids and the Sunflower Garden. Thanks to everyone who has supported us since 2010!